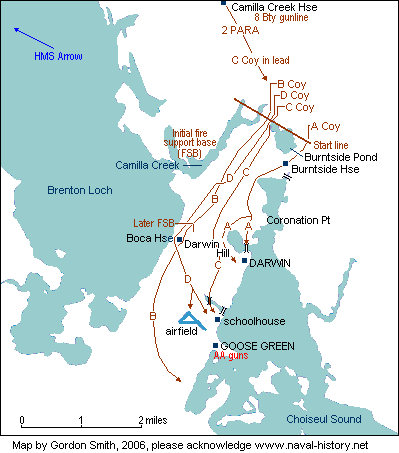 The Battle of Goose Green (May 27th to May 28th, 1982) was the first major land-battle of the Falklands War. After the British landed at San Carlos, the nearest Argentine position was Goose Green. It was felt that the position could not be ignored, and moreover that a quick victory at Goose Green would boost British morale and momentum. The British forces consisted of three companies of the 2nd Battalion of the Parachute Regiment ("2 PARA"), total strength around 600 men, supported by three 105mm artillery pieces from 29 Commando Regiment, Royal Artillery, one MILAN anti-tank missile platoon, Scout helicopters and three RAF Harriers. They attacked the Argentines holding Goose Green and the nearby settlement at Darwin, after a softening up bombardment by naval gunfire. In overall command of the British force was Lieutenant-Colonel Herbert Jones, known to his men as simply H.
The defending Arrgentine forces, known as Task Force Mercedes consisted of the 12th Infantry Regiment (RI 12) under the command of Lieutenant-Colonel Italo Piaggi, and a company of the 25th Infantry Regiment (RI 25), totalling over 1,000 men. These troops were backed by a battery of 20mm Rheinmetall anti-aircraft guns and two Oerlikon 35mm anti-aircraft guns, all of which were employed in a ground support role, as well as four 105mm Oto Melara howitzers from the 4th Airborne Artillery Regiment, with air support from Pucarás based in Port Stanley. After heavy fighting, including the death of British commanding officer Lieutenant-Colonel Herbert Jones (who was posthumously awarded a Victoria Cross), the British eventually overcame the larger Argentine force . The British lost 17 killed and 64 wounded. The Argentines lost 47 killed, 120 wounded and around 1,000 captured. Additionally, the British captured a large quantity of Argentine weapons and stores. One noteable incident was that the BBC World Service announced the taking of Goose Green before it actually happened. This broadcast may have forewarned the Argentines to the impending attack, and was seen as an act of disloyalty by many in the British military. Indeed, at one point, Lieutenant-Colonel Jones even threatened to lead the prosecution of senior BBC officials for treason.